LAHAN, Oct 13: Three-year-old Mahomad Toshif got his right eye injured while playing with friends last week. As the boy was constantly troubled by the itching eye, his father Aisanul, a local of Ghoganpur-6 of Saptari district, took him to the nearby Kanchanpur market for treatment. At Kanchanpur, he met Dr Shyam Sundar Sah who suggested him to visit an eye specialist. People here normally have to go to either Lahan or Biratnagar to meet an eye specialist. Therefore, Aisanul returned home to borrow some money from a friend to take his son to a big city for treatment. The next day when he was about to board a bus to Lahan, he overheard something pleasant. “Eye treatment now in Kanchanpur,” said a loudspeaker much to his relief. Aisanul gave more attention and the loudspeaker was repeating the same thing again and again. Instead of heading to Lahan, he went on to meet the man who was making the claim over the loudspeaker. To his pleasant surprise, he was informed that he need not take the boy anywhere since Kanchapur town itself offers treatment. “It was a huge relief,” he said. 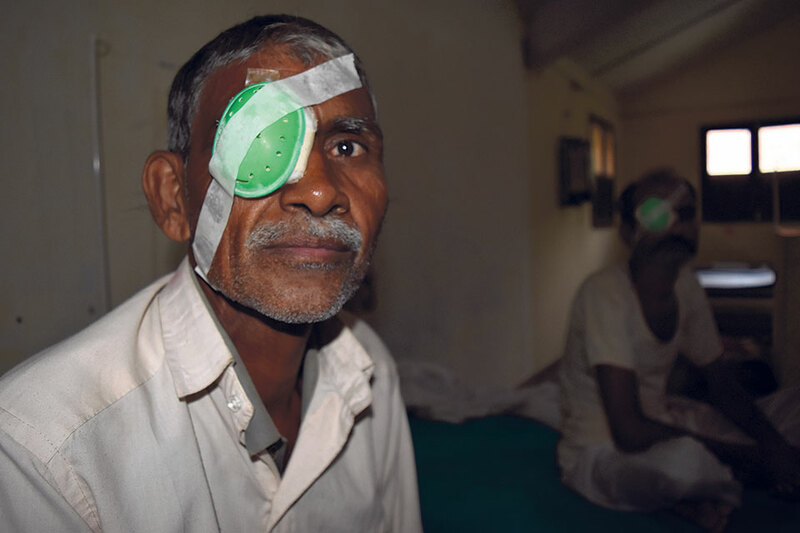 The eye treatment at a primary health center of Kanchapur is a part of service extension of Lahan-based Sagarmatha Chaudhari Eye Hospital (SCEH). The center was inaugurated on Thursday marking ‘world sight day’. The hospital already has other 10 such centers at various areas. “It is a great service for the people like us. It’s a boon,” said Aisanul. The center is providing not only eye but also ear-related treatment. According to Aisanul, he had no hassles in getting doctor’s appointment. “They gave a good treatment and the fee was negligible,” said the elated father. “If I had to go to Lahan, traveling alone would have incurred much more expenses,” he added. Medical superintendent of SCEH Dr Sanjay Kumar Singh had handled the boy’s case. “The doctor told me that my boy had developed eye allergy and he is going to be fine. Just that we need to take care of his health and hygiene,” Aisanul reported. “It was such a good experience as we didn’t have to bear much expenses and there was not hassles of traveling,” he added. Aisanul paid Rs 100 for the treatment and medicine. And the boy is already recovering, he said. A huge crowd had gathered at the eye treatment center. They were curious to know whether the service would be regular. Speaking at the program, mayor of Kanchanpur Municipality stated that the eye center is going to be of a great value to the people of the region. At the program, president of the eye hospital Rabindra Lal Chaudhari was also felicitated. “It is our aim to expand the service to every nook and corner of the country. Whether it be the people of hill or plain or mountain, they have the right to perfect eyesight. We are committed to expanding our service further in coordination with the local governments,” Chaudahri said to a big applause. The hospital in Lahan was founded in 1983. Initially, it had only 12 beds and a small eye unit. The growth has been encouraging with increasing number of eye care centers and expanded capacity of the hospital in Lahan. Due to its ‘quality service at low cost’, patients throng here not only from towns and villages of Nepal, but also from India. As per the data, Indians from Assam, Chhatisgadh, Delhi, Gujarat, Hariyana, Jharkhand, Meghalaya, Nagaland and Orissa visit the hospital for treatment. According to the manager of the hospital, Abhishek Roshan, the number of patients is constantly rising. “Both Nepalis and Indians come here. Our quality service at affordable rate pulls them here. Basically for the poor, this hospital is a boon,” he noted. So far, the hospital claimed that it has already performed eye surgery of over one million patients. It has offered treatment to nearly five million. “Our hospital is considered among one of the best eye hospitals in the world,” Chaudhari said. “Even though there are hundreds of other hospitals in India, people come here because we don’t compromise on quality,” he added. The patients don’t have to pay hefty service charge because the hospital gets donations from various organizations. Initially, the hospital started its service with the support from Christoffel Blind Mission based in Germany.